On our way back to Yangon from Bago city, our whole day taxi driver had a brief stop at Hsin Hpyu Daw Park where the white elephants can be seen. We didn’t plan to visit any white elephants but the driver insisted and told us it is on the way back to Yangon, so we just followed what he suggested. 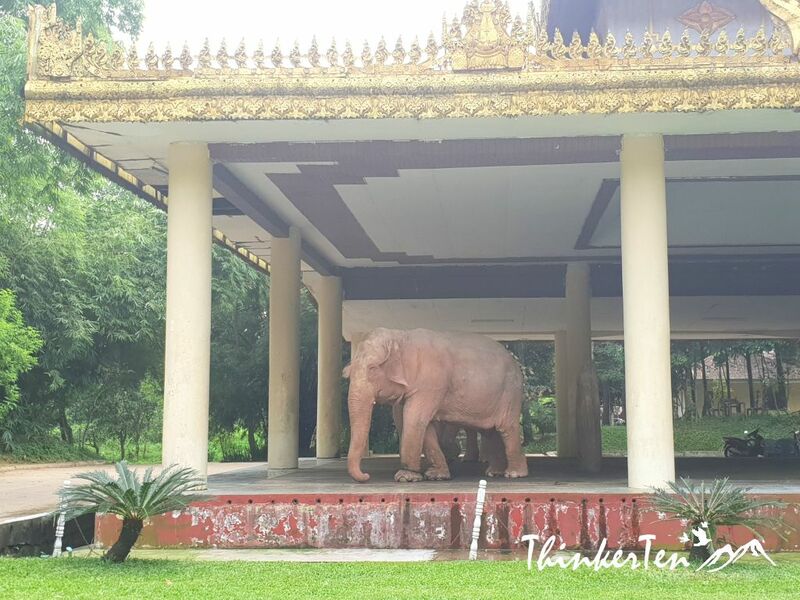 It seems like white elephant in Hsin Hpyu Daw Park is a major attraction for tourists. Before us, there were already few couples of foreigners with their English-speaking guide at the park. 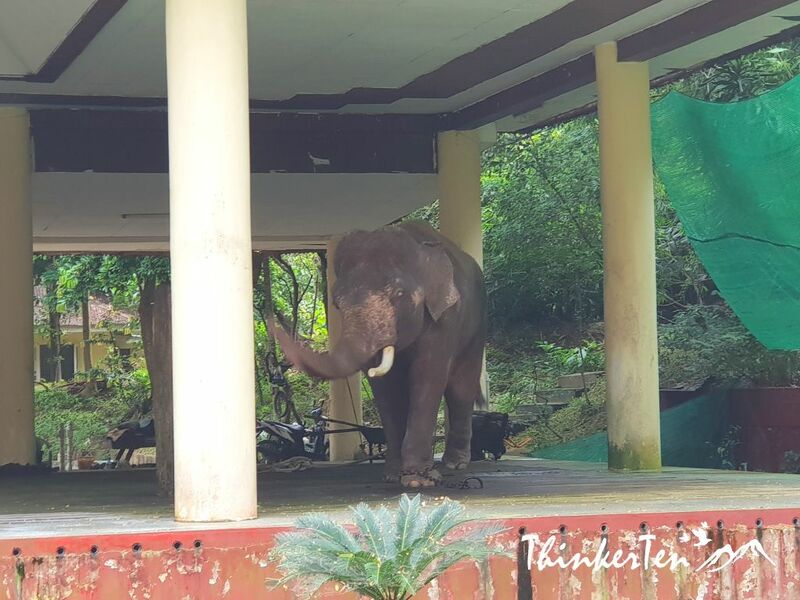 The elephants are kept in the beautiful pavilion but visitors are not allowed to go near them. A total different experience I had in Chiang Mai Thailand where you are able to get up close and touching and feeding the elephants. Over here in Hsin Hpyu Daw Park, there is a fence to block visitors from entering anywhere near these elephants. Visitors are only allowed to watch the elephants from behind the fence. In total there are only three elephants all with slightly different colors tone. One is more of pinky white, suspected to be albino and the other is more pinky and the third one is just the usual color of the elephant, which is dark grey. If you look closer, all three elephants were chained at their feet. They seem pretty sad and wanted to roam around. But it was said the elephants are allowed to roam freely after the park is closed at 5 pm. I still sorry to see them all being chained at their feet. I overheard a local guide telling a couple of caucasian tourists: “Animal is still animal, you never know what they will do to the human if unchained.” Still, it was very sad thing to see. This is totally different experience from the Elephant camp in Chiang Mai Thailand. The elephants in Chiang Mai Elephants Camp are all happy, cheeky and playful. I was disappointed to learn the truth about the white elephant park here. 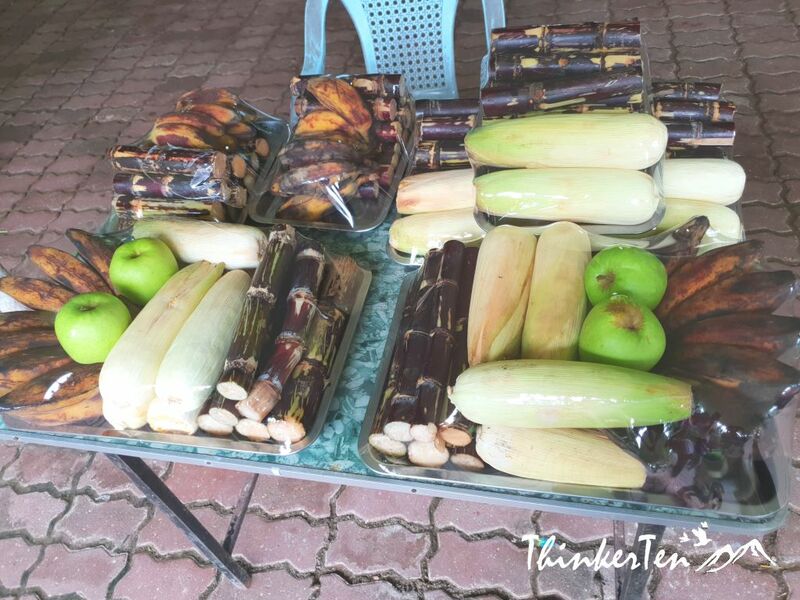 Some food that you can purchased for the elephants but you won’t be allowed to feed them yourself, the elephant keeper will bring in the food and feed them instead. 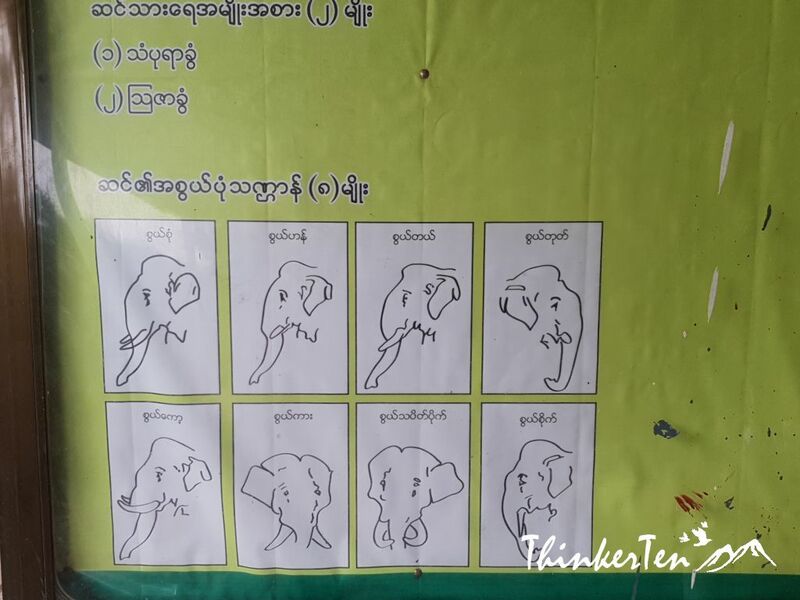 There are posters showing some introduction of the white elephants. One male and two female lives in this beautiful pavilion. Burmese people worship Elephant and think that it an auspicious animal that is being white which is symbolise of purity, power and good fortune. I found some pots in the middle of the park, got curious so went to open up the pot and have a look what was inside. Is just plain water and there are bowls too, probably for the thirsty visitors. 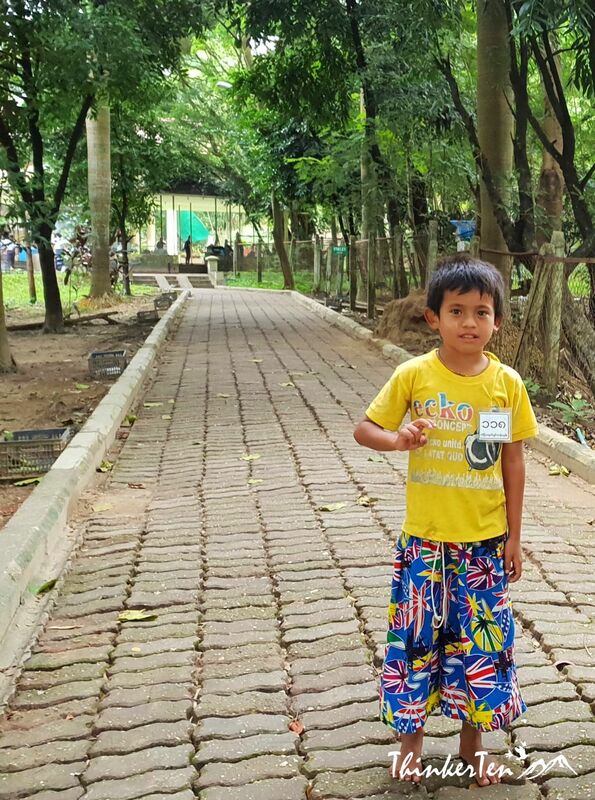 Burmese kid saying hello to us and he has a name tag with him but it was written in Burmese, not sure if the tag say their name. They don’t speak any English but very friendly. There is no entrance fees to White Elephant Park. The entrance to the park is also not that obvious as there is no signboard. 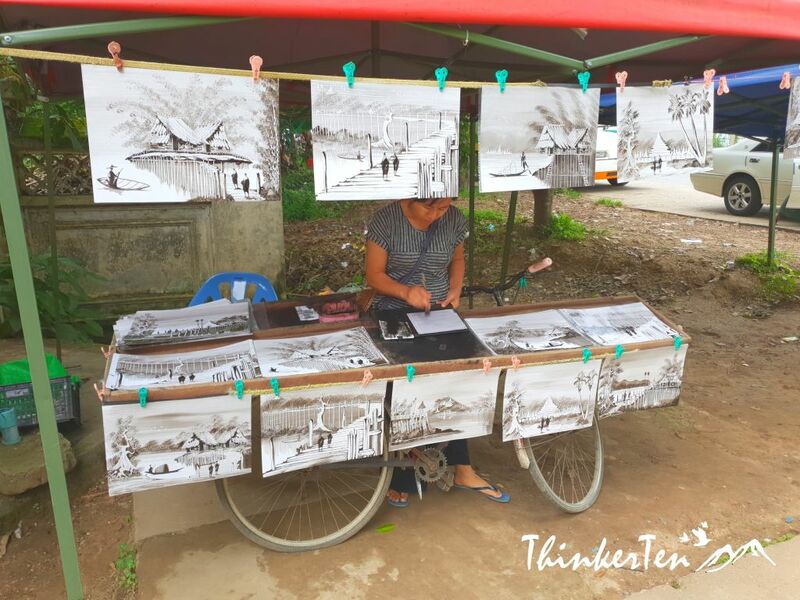 You see few stalls setting outside the White Elephants Park and many children roaming outside the entrance. Children faces were all painted with the Thanaka yellowish powder, a signature in Myanmar. 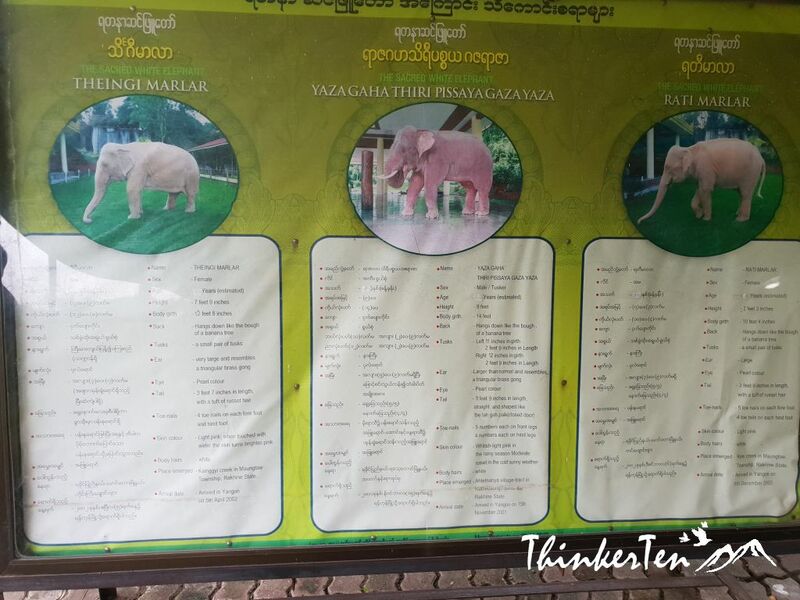 The White Elephants Park near Yangon was not in our plan at all. We have a brief stop. It was my first time to see elephant in this color, the white pink greyish. However, not a very happy feeling as the elephants were chained and not allowed to roam freely. They look sad to me and who doesn’t if freedom is being constraint. Not sure it is the right way to worship the white elephants? I have never seen. Albino elephants but I don’t really like seeing them in chains. It is really sad but atleast you got to see them. I can’t agree more. It is pretty sad to just look at them being chained. I LOVEEEEE stumbling upon unexpected finds when traveling!! It makes it that much more real!! What an awesome find! Thats true. White elephants are comsidered sacred in many of the Asian countries. They chain them?? This is bad, it hurts to see those cute elephants in chains. They worried the elephants got angry and hurt the local people who lives nearby. Those elephants are beautiful, it is so sad to see them in chains though. You are right about it, it was not a pleasant feeling. I have never been to Myanmar, but it looks absolutely beautiful! There seems to be a lot of places to visit and things to do! Thanks a lot for the awesome post! The chained elephant is sad but the place is gorgeous for sure! Can’t wait to visit it! I still very much prefer the Elephant Camp in Chiang Mai Thailand where you see the elephants are so jovial and friendly. Over here there are only three pathetic looking elephants with chain. However this sort of color is my first encounter! I have to say I thought the same thing as you, for a people who worship these creatures, how sad that they are chained up! Get a taller fence if you’re worried about human interaction! I’m sure it was an interesting experience! Aren’t you glad that your driver insisted??? Such a beautiful animal! How exciting to see a white elephant. I must say I find it quite distressing to see them chained up like that. While they are quite beautiful and I am glad you got to see them, I hate to see any animal in captivity. That is sad to see such a majestic animal confined like that. But interesting to tour other countries and see what it is like. I have never been there but definitely a nice place to visit and once I get there meeting that elephant is my first activity that I am going to do. What beautiful elephants – it must have been such an experience to see them as close as you did. I love unexpected discoveries like this. So sad to see them chained up. They’re really such peaceful animals and beautiful. I love elephants. I would really love to visit one day so I can see the elephants up close. I would never visit this park! How sad to keep the elephants chained up, such cruelty to these beautiful animals. Oh no, this is so sad :'( I hate to see this. Poor magnificent creatures! really upsetting that the elephants are chained. they don’t even do that in zoos here in America! I agree that having animals chain is just unacceptable, no matter which part of the world. 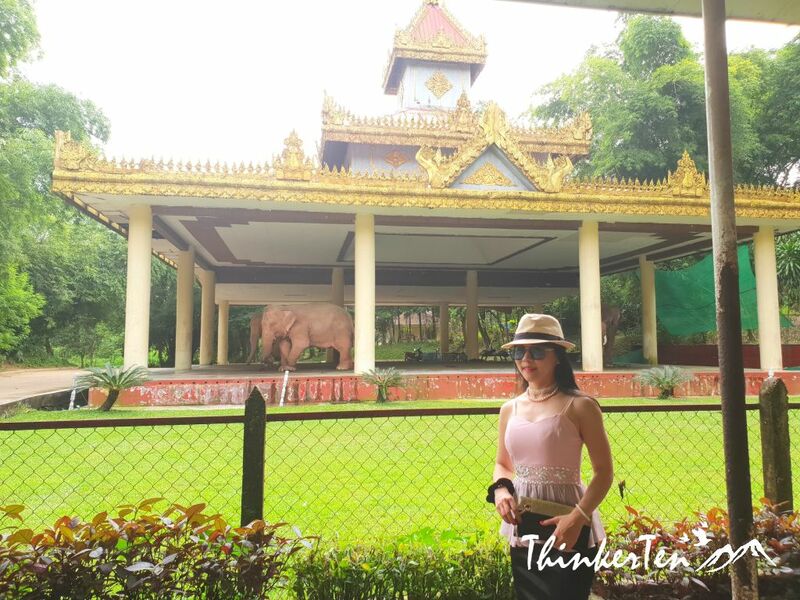 The White Elephants Park near Yangon looks like a great spot for a visit. I’d love to see the elephants at such a close distance, but it’s definitely true that they should be free and not chained for sure! I hate to see any animal confined or chained. I regret my part in some past experiences with the animal kingdom, like riding one of these majestic animals. I wish you could have seen them under different circumstances. Wao this is such a different place… so green and the colors so bright. I don’t lik chains of any kind though…. What a fascinating sight, but it’s just so sad with the chains. Humans are more wiser than animals, so it is best if humans will adjust not the animals. Chaining them is stupid. 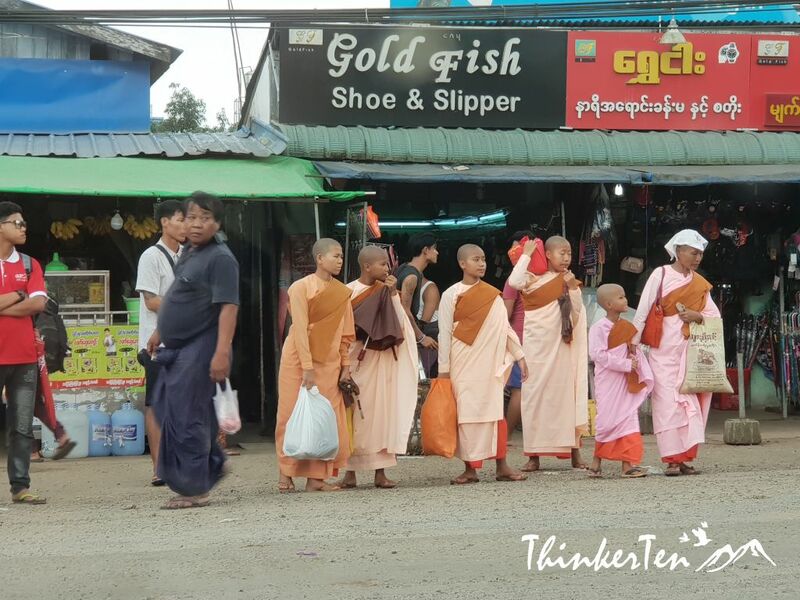 Such perfect timing, my friend is in Myanmar right now. I will forward this post to her, she is also a blogger so your post will interest her. These elephants are so beautiful but so sad to hear that they have to be chained down. That is a horrible way to live, I wish they could make stronger gates to keep them away from the people and not have to be chained. I think if you treat the elephants well, give them enough food and plenty of activities to do and lots of love, they can’t be dangerous. Seeing them in chain is so heart breaking. Such a wonderful idea. 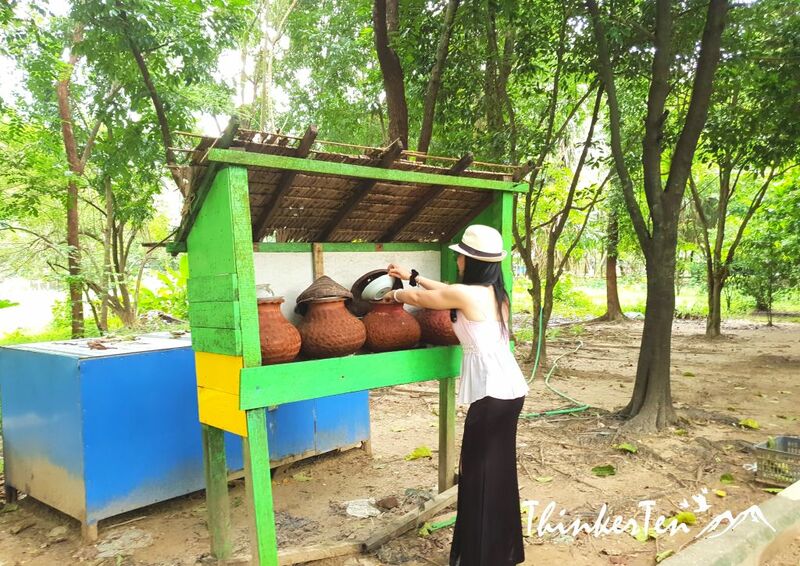 Really loved reading this post! Interesting but animals should be on their own. 🙁 … We live together with them and they have as much the right in every way. It also saddens me to see them chained. I haven’t seen any albino or pink elephants before. I can just imagine how beautiful they are too see in person. Elephants are really adorable even though they are really huge. This is such an interesting post. Nice shots btw. I love random finds like these, this is certainly a great site seeing and historical place.